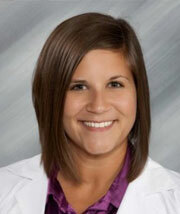 Dr. Caitlin Wise is a graduate of The Ohio State University College of Optometry. She attended Bowling Green State University for her undergraduate degree where she graduated with University and Biology departmental honors. She was a member of Phi Beta Kappa Honors Society, Mortar Board National College Senior Honors Society, and Alpha Lambda Delta Honors Society. While at Ohio State, Dr. Wise was an active member of Epsilon Psi Epsilon, a service fraternity that focuses on providing free eye care to those who cannot afford it and works closely with Pilot Eye Dogs, a company that provides guide dogs to patients in need. During her final year at Ohio State, Dr. Wise completed a rotation at the Hefner VA Medical Center in Salisbury, North Carolina where she received training in detecting and treating glaucoma, macular degeneration, and other ocular diseases. She also worked as an intern at several optometric practices in Ohio, gaining experience and training in contact lenses, pediatric examinations, and pre/post-operative treatment. Dr. Wise is a northeast Ohio native, as she grew up in Wadsworth and now resides in Coventry. She enjoys Saturdays in the fall (O-H!) and in her spare time she enjoys traveling, boxing, and spending time with family and friends. Dr. Wise can be seen in Green on Tuesday, Thursday, Friday, and one Saturday a month. She can be seen in Fairlawn on Wednesdays.